Falcon, Sam Wilson, was introduced into comics back in 1969 and became Captain America's partner. He wasn't flying then yet but later came across some wings. They were always made by other people as Sam did not have the ability to create such things. He also was later given the power to communicate with birds. Initially this was specifically with his pet falcon Redwing and was stong enough to for him to be able to see through the bird's eye. Later he became able to control all kinds of birds. There is also a version of Sam Wilson that is an excellent inventor. That version, while not represented in animation, did indeed create his own wings. The Falcon's first animated appearance was in the ill-fated series, The Avengers: United They Stand in 1999, 30 years after his comic book debut. He was voiced here by Martin Roach. In this series he was more of a street hero like his comic counterpart being able to do little more than fly and fight. He did seem to be able to talk verbally to Redwing who made an appearance here as well. The character got an action figure out of it that came complete with a snap-on Redwing. 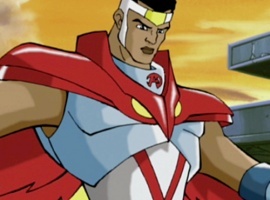 Falcon's next animated appearance was in The Super Hero Squad Show in 2009. This Falcon was a younger version and now had the additional ability to launch blades of some sort from his wings. Redwing appeared here also. This series was created for younger viewers and often his main job was to keep Hulk calm. Falcon was a series regular and was voiced here by Alimi Ballard. The character next appeared in The Avengers: Earth's Mightiest Heroes in 2012 and was voiced by Lance Reddick. He was not a series regular but he made quite an imposing appearance when he did show up. He appeared to be quite skilled and focused here and a match for nearly any Avenger. At the time of this writing, Falcon currently appears in the animated series, Avengers Assemble. He is a series regular. The character here is younger (about 18 years old), has S.H.I.E.L.D. training and is a technology whiz, second only to Tony Stark, Iron Man. His wings are really a form of armor, created by Iron Man and have been upgraded further in the first season of the show. The character is voiced here by Bumper Robinson. Being a Marvel character and part of that universe, Falcon has also made appearances in multiple Marvel animated series including Ultimate Spider-Man.